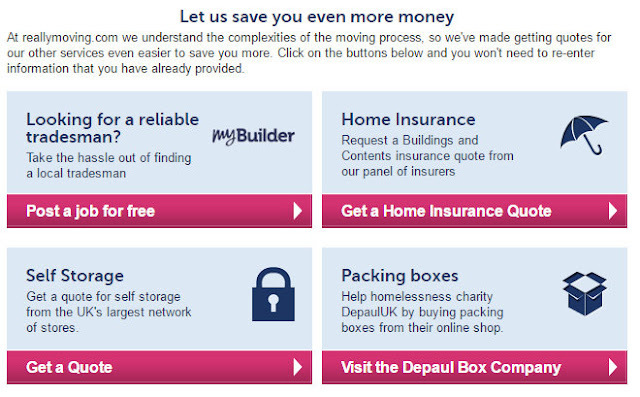 Where Roots And Wings Entwine: The cost of moving house - reallymoving.com Moving Cost Calculator review. 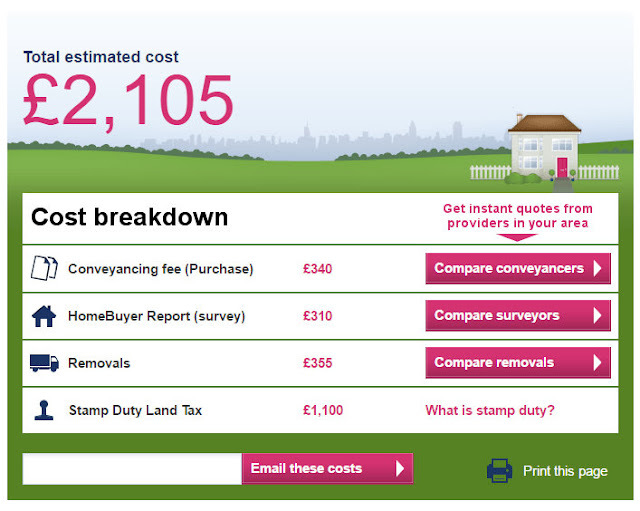 The cost of moving house - reallymoving.com Moving Cost Calculator review. Over the years I have moved house many times. The number of times I had moved house had reached double digits by the time I hit my teenagers years and since then I have moved quite a few times again. When I was a child moving house was quite an exciting time and as we thankfully always stayed in the area I never had the upheaval of new schools or saying goodbye to friends. Whilst my mum had the all the hassle of dealing with the paperwork and hard work of moving house my sister and I just had the excitement of settling in to a new house with new bedrooms that we could decorate to our own taste and lots of boxes to play with once the unpacking had been done! Since the first time I left home and set up in a new house all by myself when I was 18 (unfortunately quite a few years now) I have had to deal with the process of looking for a house, dealing with the paperwork and the hard work of moving all my belongings from one house to another. Now that I have experienced the responsibility of moving house a few times I can relate to what my mum dealt with many times during my childhood and can honestly say that moving house is a stressful experience. Whilst moving house still has a touch of excitement as an adult I can understand why they say moving house is one of the most stressful experiences one can experience during their life. Moving house is hard work, nerve wracking, tiring and expensive! With 2 kids and a strong committed relationship to each, Lee and I have recently been looking at and starting the process of buying our forever home. Whilst we have dabbled with the idea of moving 200 miles to live near Lee's family as all love the area we live in now so much we have decided we need to put down our roots here and find a place we can truly call our own. 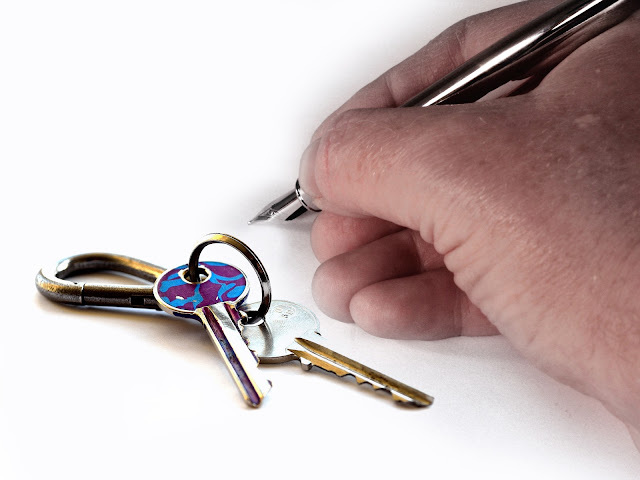 We dream of the day we sign contracts and get the keys to our own home. As moving house is expensive now that we are planning on buying our first house I have been looking at ways to cut the costs of moving house and checking to make sure that we are moving and buying our own house for the best price and not overpaying for any services we need. Thanks to their easy to use and very useful Moving Cost Calculator I have been able to see how much moving and buying our first house would cost us and see the cost of conveyancing, homebuyer report and removals. To be honest as a complete novice to the process of buying a house having previously always rented I wrongly assumed that the conveyancing fee and survey cost would be in their thousands, but thanks to this nifty calculator I have seen that they are a lot more affordable than I had previously thought with it costing an estimated £2,105 instead of the thousands of pounds I had assumed. Thanks to the site and the moving cost calculator not only can I see the cost of moving but I can also compare the cost of the home-moving services by getting instant quotes from credit checked and fully insured providers in our area for conveyancing, surveys, and removals. Having previously used a removal company to move the same distance we are looking at moving now and in the same area I already know the rough cost of using a removal company to move. As we used a removal company recently and got a number of quotes when we did I have budgeted between £600-£700 for using a removal service when we move. 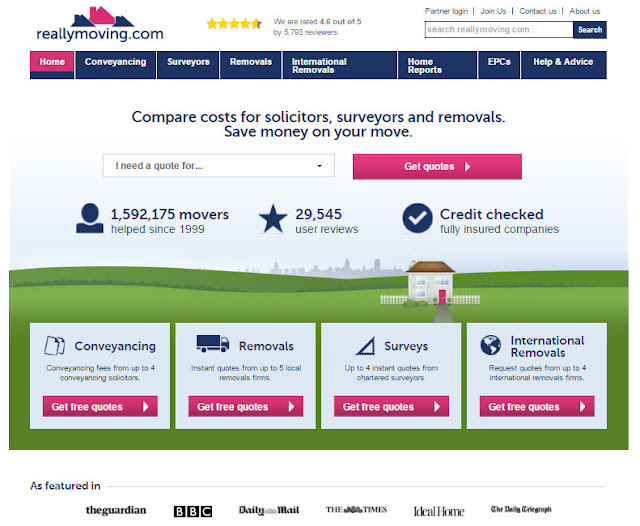 To my joy using the comparison service offered by reallymoving.com I have found that we could save at least £200 on the cost of removals when moving house! To help you compare services and decide on the best provider for you as well as having instant access to quotes on the website, quotes are also emailed to you for future reference where the cost is broken down so you can see exactly what services you are getting for your money (conveyancing quotes details services such as legal costs, land registry registration fee, and environmental search). 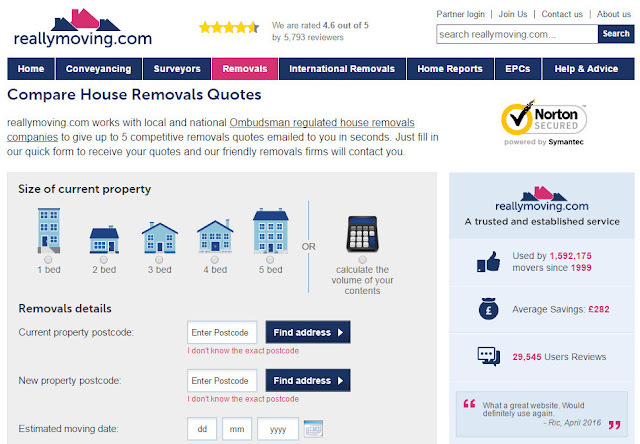 Reallymoving.com is a very useful website that takes a little bit of stress out of the moving process by helping users find providers and services needed for moving house, detailing the cost of moving house for the users situation and helping users save money when moving house. 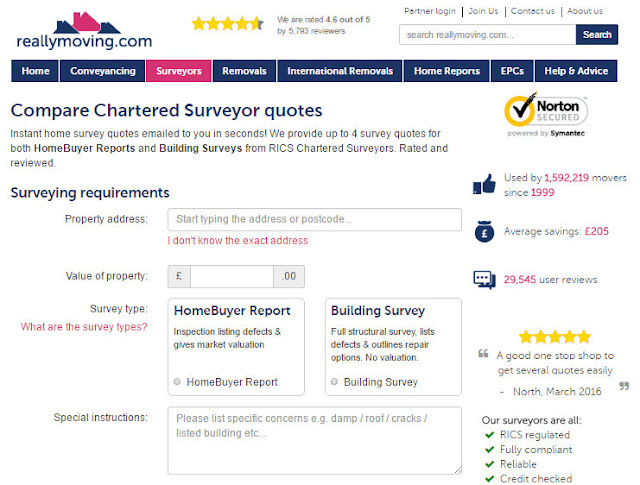 As the established site which is trusted by over a million users is a lifesaver when moving house I have it bookmarked to help us through the process of moving to our new house. Not only will I be using their moving cost calculator and comparison service but I will also be making use of the other advice and services they provide on the website such as quotes for other vital moving house services, tips on how to cut the costs of moving house, moving house checklist, and first time buyers advice.